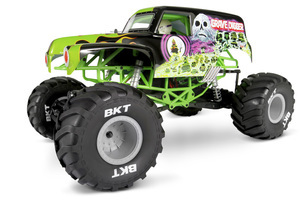 It’s happening, the rise of radio controlled monster trucks is making a resurgence. When I was a kid, a long time ago, there were a ton of monster truck options. Most of them were offered by Tamiya and Kyosho. The Clodbuster, Lunchbox, Double Dare, Midnight Pumpkin, Big Brute, Black Foot, Monster Beetle, USA-1, Sledgehammer, and the list goes on. These things were awesome. Not all of them were four wheel drive, but some were. 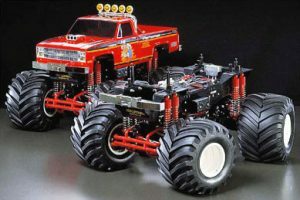 The Tamiya Clodbuster has been around a long time with it’s 4-wheel steering and giant tires. I have one myself along with a few of the other vintage monsters, but it’s all going to change soon. 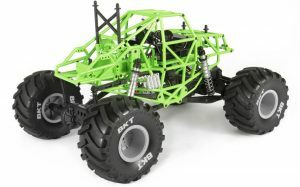 The radio controlled monster truck is reaching a new height when the 1/10 scale replica of Grave Digger is released by Axial in August in the form of the SMT10™ (scale monster truck). They have gone to great lengths to make it as close to the original than any other manufacturer in the past. It has solid axles like the real deal, a full cage, amazing realism, and so much more. The question is, will more manufacturers follow or will this be an Axial only thing? My hope is Traxxas will step their game up and enter the ring. Especially after becoming the title sponsor for the Monster Truck Destruction Tour with the world famous Bigfoot! Time will tell and it’s a great time to be an R/C hobbyist. The promotional video (shown below) released by Axial is very awesome combining video of the real truck with the r/c truck. I can’t wait to see one in person. Be sure to comment with your impressions! Totally awesome…cannot wait to get one!